With the advent of automotive intelligent lighting solution, lighting manufacturers enable automotive OEMs to offer enhanced active safety features, such as adaptive lighting and improved interior lighting such as intelligent ambient lighting, to consumers. The constant evolution of the technologies such as adaptive lighting and intelligent ambient lighting is bound to expand many other applications such as adaptive rear lamp, adaptive indicators, and adaptive parking light, among others. The major driving force behind the rising adoption of adaptive lighting and intelligent ambient lighting are stringent safety rules and regulation by government of different countries and rise in demand of comfort and luxury. The automotive adaptive lighting market has grown extensively and is on the transition from traditional lighting technologies such as halogen and xenon to LED. Energy efficient LED lighting sources are gaining popularity due to stringent government regulation on vehicular emissions. The rapid decline in LED prices is also encouraging the automotive manufacturers for the development of LEDs for different applications in vehicles such as interior/ ambient lighting. The demand for automotive intelligent lighting varies according to various geographical regions. The automotive intelligent lighting market holds a prominent share in various countries of North America, Asia-Pacific (APAC), Europe, and Rest-of-the-World (RoW). Geographically, Europe led the global automotive intelligent lighting market in 2017 in terms of value. Additionally, APAC region is expected to witness the highest growth during the forecast period (2018-2023). Growing automotive industry, rising disposable income, and increasing manufacturing facilities are some of the factors contributing to the market growth in the APAC region. The global automotive intelligent lighting market has witnessed several strategic and technological developments in the past few years, undertaken by the different market players to attain their respective market shares in this emerging domain. Some of the strategies covered in this section are product launches & development, business expansion, partnerships and collaborations, and mergers and acquisitions. The preferred strategy for the companies has been business expansion in order to strengthen their position in the global automotive intelligent lighting market. 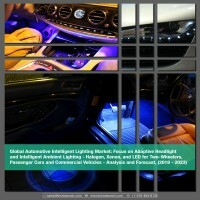 The key market players in the global automotive intelligent lighting market are General Electric, Gropo Antolin, Hella GmbH & Co. KGaA, Hyundai Mobis Co. Ltd, Ichikoh Industries, Ltd., J W Speaker Corporation, Koito Manufacturing Co. Ltd, Magneti Marelli S.p.A, OSRAM GmbH, Signify Holding, Stanley Electric Co. Ltd, Valeo Group, Varroc Group, and Zizala Lichtsysteme GmbH. • What is automotive intelligent lighting? • How big is the automotive intelligent lighting (adaptive headlight and intelligent ambient lighting) market in terms of revenue and what is the CAGR (2018-2023)? • What is the revenue generated by the different technologies such as halogen, xenon, and LED? • What is the revenue generated by the different vehicle type such as two-wheelers, passenger cars, and commercial vehicle? • What is the revenue generated by the different end-market such as original equipment manufacturer (OEM) and aftermarket? • What are the major technological trends, which would affect the market ecosystem? • Which are the key companies operating in the automotive intelligent lighting market? • Which global factors are likely to impact the automotive intelligent lighting market? • What are the key market strategies adopted by the automotive intelligent lighting market players? 10.4 Hyundai Mobis Co. Ltd.
10.7 KOITO Manufacturing Co. Ltd.
10.11 Stanley Electric Co. Ltd. The global automotive intelligent lighting market is expected to grow at a CAGR of 8.44% in terms of value during the forecast period 2018-2023. This growth can be attributed to the increasing demand for advanced active safety features such as adaptive headlights. Furthermore, the rising demand for advance intelligent ambient lighting and advantages associated with automotive intelligent lighting are expected to drive the global market for automotive intelligent lighting during the forecast period (2018-2023). The factors driving the growth of the global automotive intelligent lighting market include increase in vehicle sales globally and growing emphasis toward road safety, owing to which government of different countries including China, the U.S., and Germany, among others have mandated advance safety features such as ABS. Additionally, inclination toward comfort and luxury boosts the automotive intelligent lighting market demand. However, even with such enormous growth of demand, the global market for automotive intelligent lighting is facing immense challenges, which include high cost associated with automotive intelligent lighting and fluctuation cost of raw material. Moreover, factors such as increasing adoption of two-wheelers adaptive headlight by automotive OEMs and wide-ranging opportunities in emerging economies are expected to create numerous opportunities for the market growth. Additionally, technological advancement, such as packaged LED and laser diode for automotive lighting and OLED panel for automotive interior lighting are expected to create numerous opportunities for the market players, thus boosting the market growth. On the basis of technology, the automotive intelligent lighting market includes halogen, xenon, and LED segments. LED dominated the global automotive intelligent lighting market in 2017 and is anticipated to maintain its dominance throughout the forecast period. The LED light segment is expected to grow at the fastest rate among all the light sources for automotive intelligent lighting market during the forecast period. Factors, such as declining average price, low energy consumption, and increased service life are diving the demand of LEDs for automotive intelligent lighting market. Moreover, growing application of LED in automotive intelligent lighting such as two-wheeler adaptive headlight and intelligent LED ambient lighting for passenger car and commercial vehicle fuel the market growth. In future, halogen and xenon light segment are likely to witness decline in market share, owing to their disadvantages including higher energy consumption and more limited applications as compared to LED, laser, and OLED. The passenger car segment was the largest contributor to the overall market revenue in 2017. The major factors such as growing sales of passenger cars especially in the emerging countries, increasing disposable income, and technological advancements boost the overall intelligent lighting market for passenger cars. Commercial vehicles market for intelligent lighting is expected to grow at a moderate growth rate in the forecast period, owing to factors such as increasing government regulations for better automotive safety systems and steadily rising commercial vehicle industry across the globe. Automotive intelligent lighting that includes adaptive lighting and intelligent ambient lighting is an advance lighting solution for passenger cars and commercial vehicles. Only adaptive headlights are considered under adaptive lighting as the scope for other adaptive lightings, such as adaptive rear lamp, adaptive fog lamp, and adaptive indicators, among others, is very narrow. Intelligent ambient lighting dominated the global automotive intelligent lighting market in 2017 and is expected to maintain its dominance throughout the forecast period. This is mainly due to the rising demand for comfort and enhanced driving experience in passenger car and commercial vehicle, boosting the demand of intelligent ambient lighting. The adaptive headlight segment is expected to grow at the fastest rate during the forecast period. This is mainly due to increasing demand of advance active safety features such as adaptive headlight and adaptive rear lamp in passenger car and commercial vehicles. The automotive adaptive lighting revenue is generated mainly through two end-markets: OEM and aftermarket. The OEM segment dominated the global automotive intelligent lighting market and is expected to maintain its dominance throughout the forecast period. Increased vehicle production, changing consumer preferences, and affordable product offerings by OEMs are some of the key factors responsible for a high growth rate of automotive lighting market. This report also covers the global automotive intelligent lighting market, by geography and consequently provides the revenue of the key regions which include North America Free Trade Agreement (NAFTA), Europe, Asia-Pacific (APAC), and Rest-of-the-World (Middle East & Africa, and South America). Europe dominated the global automotive intelligent lighting market and is anticipated to uphold its dominance throughout the forecast period. The automotive intelligent lighting market in Europe is majorly driven by the need for safety against collision due to less visibility especially at night on highways. Additionally, increasing number of high-end passenger cars such as BMW, Audi, Mercedes Benz, and Volvo, among others is expected to boost the market growth. The automotive intelligent lighting market in APAC is expected to grow at the fastest rate among all the regions between 2018 and 2023. Growing automotive industry, rising disposable income, and increasing manufacturing facilities are some of the factors contributing to the market growth in the APAC region. The global automotive intelligent lighting market has witnessed several strategic and technological developments in the past few years, undertaken by the different market players to attain their respective market shares in this emerging domain. Some of the strategies covered in this section are product launches, product developments, and business expansions, among others. The preferred strategy for companies has been business expansion in order to strengthen their position in the global automotive intelligent lighting market.